The Chicago Tribune, founded in 1847, is a major daily newspaper based in Chicago, Illinois. 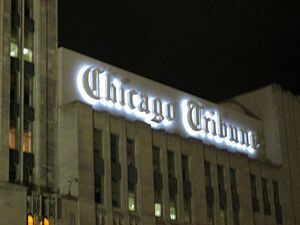 The Tribune Company, which began with the Tribune, currently owns a number of other ventures including the Chicago Cubs baseball team and the Los Angeles Times. Formerly self-styled as the "World's Greatest Newspaper," the Tribune remains the principal daily newspaper of the Midwestern United States and one of the largest daily newspapers in America. Since its founding, the Chicago Tribune has maintained political allegiance to the Republican Party, but in recent years has moved to a generally centrist editorial position. Its thorough coverage of topics important to readers in Chicago and the Midwest, and its embodiment of Midwestern sensibility, have won it a loyal readership and a position of influence in the country. The Tribune was founded by James Kelly, John E. Wheeler, and Joseph K.C. Forrest, with its first edition published on June 10, 1847. The paper saw numerous changes in ownership and editorship over the next eight years. Initially, the Tribune was not politically affiliated although it tended to support either the Whig or Free Soil parties against the Democrats in elections. By late 1853, the Tribune was frequently running xenophobic editorials that criticized foreigners and Roman Catholics. About this time it also became a strong proponent of temperance. In February 10, 1855, the Tribune formally affiliated itself with the Know-Nothing Party, or American party, whose candidate Levi Boone was elected Chicago mayor the following month. The lead editorial in the first issue the Chicago Tribune published after the Great Chicago Fire of 1871. By mid-1855, Joseph Medill and Charles Ray had bought shares in the paper and taken over editorial policy. Under their leadership, the Tribune distanced itself from the Know Nothings and became the main Chicago organ of the Republican Party. However, the paper continued to print anti-Catholic and anti-Irish editorials. The Tribune absorbed three other Chicago publications under the new editors: The Free West in 1855, the Democratic Press in 1858, and the Chicago Democrat in 1861, whose editor, John Wentworth, left his position to become Chicago mayor. Between 1858 and 1860, the paper was known as the Chicago Press & Tribune. After November 1860, it became the Chicago Daily Tribune. Before and during the American Civil War, the new editors pushed an abolitionist agenda and strongly supported Abraham Lincoln, whom Medill helped secure the Presidency in 1860. The paper remained a force in Republican politics for years afterward. Under the twentieth century editorship of Colonel Robert R. McCormick the paper was strongly isolationist and actively biased in its coverage of political news and social trends, calling itself "The American Paper for Americans," excoriating the Democrats and the New Deal, resolutely disdainful of the British and French, and greatly enthusiastic for Chiang Kai-shek and Senator Joseph McCarthy. McCormick died in 1955, just four days before Democrat Richard J. Daley was elected mayor for his first term. One of the great scoops in Tribune history came when it obtained the text of the Treaty of Versailles in June of 1919. Another was its revelation of United States war plans on the eve of the Attack on Pearl Harbor. Its June 7, 1942, front page announced that America had broken Japan's military code, "PURPLE" or "Magic." The Tribune's legendary sports editor Arch Ward created the Major League Baseball All-Star Game in 1933 as part of the city's Century of Progress exposition. The paper is also well known for a mistake it made during the 1948 presidential election. At that time, much of its composing room staff was on strike, and early returns led the paper to believe that the Republican candidate Thomas Dewey would win. An early edition of the next day's paper carried the headline "DEWEY DEFEATS TRUMAN," turning the paper into a collector's item when it turned out that Harry S. Truman won and proudly brandished it in a famous photo. In 1969, under the leadership of publisher Harold Grumhaus and editor Clayton Kirkpatrick, the Tribune's past conservative partisanship became history; though the paper continued its Republican and conservative perspective, the paper's news reporting no longer had the conservative slant it had in the McCormick years. The paper began to publish perspectives that represented a spectrum of diverse opinions, while its editorials presented the Tribune's own views. In early 1974, in what was a major feat of journalism, the Tribune printed the complete 246,000-word text of the Watergate tapes in a 44-page supplement that hit the streets a mere 24 hours after the transcripts' release by the Nixon White House. Not only was the Tribune the first newspaper to publish the transcripts, but it beat the Government Printing Office's own printed version, and made headlines doing so. A week later, after studying the transcripts, the paper's editorial board observed that "the high dedication to grand principles that Americans have a right to expect from a President is missing from the transcript record." The Tribune's editors concluded that "nobody of sound mind can read [the transcripts] and continue to think that Mr. Nixon has upheld the standards and dignity of the Presidency," and called for Nixon's resignation. The Tribune call for Nixon to resign made news, reflecting not only the change in the type of conservativism practiced by the paper, but as a watershed event in terms of Nixon's hopes for survival in office. The White House reportedly saw the Tribune's editorial as a loss of a long-time supporter and as a blow to Nixon's hopes to weather the scandal. Although under Colonel McCormick, the Tribune for years refused to participate in the Pulitzer Prize competition, it has won 24 of the awards over the years, including many for editorial writing. 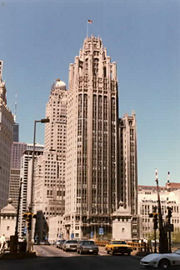 Tribune Tower, Hood and Howells, architects, opened 1925. The Chicago Tribune is the founding business unit of Tribune Company, which includes many newspapers and television stations around the country. In Chicago, the Tribune owns the WGN radio station (720 AM) and WGN-TV (Channel 9). The Tribune Company owned the New York Daily News from its 1919 founding until its 1991 sale to Robert Maxwell. The founder of the News Joseph Medill Patterson, like Robert McCormick, was a descendant of Joseph Medill. Both were also enthusiasts of simplified spelling, a hallmark of their papers for many years. Since 1925, the Chicago Tribune has been housed in the Tribune Tower on North Michigan Avenue in Chicago. The building is neo-Gothic in style, and the design was the winner of an international competition hosted by the Tribune. The Tribune Company also owns the Los Angeles Times—which displaced the Tribune as the company's largest property—and the Chicago Cubs baseball team. In 2007, billionaire real estate magnate Sam Zell purchased the Tribune Company for $8.2 billion. On June 25, 2008, the Tribune Company announced it had hired a real estate company to entertain bids of the sale of both the Tribune Tower in Chicago, and the Times Building in Los Angeles. The Chicago Tribune believes in the traditional principles of limited government; maximum individual responsibility; minimum restriction of personal liberty, opportunity and enterprise. It believes in free markets, free will and freedom of expression. These principles, while traditionally conservative, are guidelines and not reflexive dogmas. The Tribune places great emphasis on the integrity of government and the private institutions that play a significant role in society. The newspaper does this in the belief that the people cannot consent to be governed unless they have knowledge of, and faith in, the leaders and operations of government. The Tribune embraces the diversity of people and perspectives in its community. It is dedicated to the future of the Chicago region. In 2004, the Tribune endorsed George W. Bush for re-election, a decision at odds with the paper's reporting but consistent with its unwaivering support for the Republican Party (it has not endorsed a Democrat for President since 1872, when it backed Horace Greeley, a former Republican Party newspaper editor). It has endorsed Democrats for lesser offices, including endorsements of Barack Obama for the Senate and Democrat Melissa Bean, who defeated Philip Crane, the House of Representatives' longest-serving Republican. Apart from electoral endorsements, the Tribune has taken on a centrist editorial position in recent years. It has, for example, criticized the Bush administration's record on civil liberties, the environment, and many portions of its foreign policy. At the same time, it has remained economically conservative, being widely skeptical of increasing the minimum wage and entitlement spending. The Tribune has been a leader on the Internet, acquiring ten percent of America Online in the early 1990s, and then launching such websites as chicagotribune.com (1995), metromix.com (1996), and ChicagoSports.com (1999). In 2002, it launched a tabloid newspaper targeted at 18 to 34 year-olds, known as RedEye. As of 2004, the Tribune had the eighth-largest daily newspaper circulation in America, selling roughly 600,000 papers daily. ↑ 1.0 1.1 1.2 Lloyd Wendt, Chicago Tribune: The Rise of a Great American Newspaper (Chicago: Rand McNally, 1979, ISBN 0-528-81826-0). ↑ 2.0 2.1 Bruce M. Cole, The Chicago Press and the Know Nothings 1850-1856 (M.A. Dissertation, University of Chicago, 1949). ↑ Thomas M. Keefe, "Chicago's Flirtation With Political Nativism," Records of the American Catholic Historical Society of Philadelphia, Vol. 82, 131-158. ↑ Thomas M. Keefe, "The Catholic Issue in the Chicago Tribune Before the Civil War." Mid-America, Vol. 57, No. 4, 227-245. ↑ Detroit Free Press, 100 Largest US Newspapers. Retrieved January 27, 2008. Cole, Bruce M. 1948. The Chicago Press and the Know Nothings 1850-1856. M.A. Dissertation, University of Chicago. Keefe, Thomas M. 1971. "Chicago's Flirtation With Political Nativism." Records of the American Catholic Historical Society of Philadelphia, Vol. 82, 131-158. Keefe, Thomas M. 1975. "The Catholic Issue in the Chicago Tribune Before the Civil War." Mid-America 57(4): 227-245. Solomonson, Katherine. 2003. The Chicago Tribune Tower Competition: Skyscraper Design and Cultural Change in the 1920s. University of Chicago Press. ISBN 0226768007. Wendt, Lloyd. 1979. Chicago Tribune: The Rise of a Great American Newspaper. Chicago: Rand McNally. ISBN 0-528-81826-0. Chicago Tribune Tribune newspaper web site. Tribune Company Tribune corporate web site. This page was last modified on 10 February 2017, at 16:24.